"The RED Tour" was the third concert tour by Taylor. Launched in support of her fourth studio album, "RED" (2012), the tour began on March 13, 2013 in Omaha, Nebraska and concluded on June 12, 2014 in Singapore. This was the first tour by Taylor to extend to Muslim countries such as Malaysia and Indonesia. The "RED Tour" was flashy, incorporated circus elements and took full advantage of the stadiums that had now become the norm for her concerts, and was highly well-received critically. It also smashed the record for all-time revenue for a single tour by a country artist (even though most would probably agree she had fled the country coop by then). On October 25, 2012, in partnership with ABC News on the prime-time TV special "All Access Nashville with Katie Couric - A Special Edition of 20/20", Swift announced that she will launch a North American stadium and arena tour in early 2013 in support of her fourth studio album "RED" (2012). During a radio interview with WRVW, Swift mentioned that "it's nothing like any other tour before." Taylor had used Tom Petty's "American Girl" as her entrance song on her previous tour but now took the stage to Lenny Kravitz's version of "American Woman". Every night, she sang a cover of The Lumineers's "Ho Hey", intertwined with her own "Stay Stay Stay". Nobody could touch her for fan hysteria, either. The audience was part of the show, with their homemade red costumes, placards, Lite Brite codes and more glowsticks than an Inspiral Carpets reunion. For most of them, Taylor was the first girl they’ve seen play a guitar, a signifier that cannot be denied. Once the lights went out, the screaming never flagged, and neither did the star. But the best moment was the double-shot of “I Knew You Were Trouble” into “All Too Well.” Taylor turned “Trouble” into a blast of razzle-dazzle choreography in fancy-dress masquerade-ball mode. Then she sat alone to play “All Too Well,” her most majestic ballad, just a girl and her piano and several thousand other girls singing along. It was the highlight of a show that was nothing but highlights. Seeing Taylor onstage then was witnessing a level of total commitment, total fan fervor, total connection between audience and performer. No other performer really hit that pitch of happy/free/confused/lonely hormonal anguish with so much wit and empathy. Her moods are her universe and expressing them is the reason the universe exists. This is a useful conviction for a singer to have, even if it’s more dangerous for the rest of us. But Taylor wore it like a true arena-rock goddess at an amazing peak. Every night, Taylor would sing a secret song -- an acoustic version of one of her old songs. Fans could suggest songs online through Twitter and Facebook and Taylor would sing the most requested one. Sometimes she sang a song that a fan from the pre-show Meet & Greet wanted to hear. Taylor became the first solo female artist in 20 years to headline a national stadium tour through Australia, with the last being Madonna's "The Girlie Show World Tour" in 1993. Swift performed to a crowd of over 40,900 fans at the Allianz Stadium in Sydney, Australia, becoming the first female artist in history to sell out the stadium since it was opened in 1988. 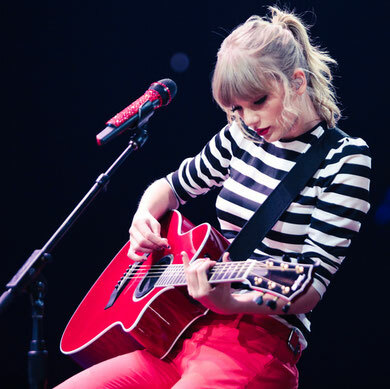 "The RED Tour" also became the highest-grossing tour by a country artist in history, bringing in an overall gross of $150 million surpassing the prior country artist record held by double-billed Tim McGraw and Faith Hill "Soul2Soul II Tour" that brought in $141 million.